Blurb from the 1965 Mariposa Folk Festival program. 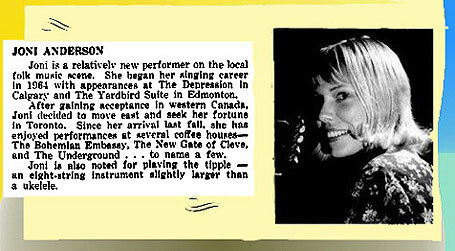 The humming of the wheels..."
After leaving art-college in June 1964, Joni moved and settled in Toronto. She struggled to get into the music business but couldn't afford the money to join the musician's union, and was unable to find many jobs without that membership. She worked at Simpsons-Sears, and other department stores throughout the second half of 1964. Joni also found out that she was pregnant by her college ex-boyfriend, and in February 1965 she gave birth to a baby girl. Joni was now alone with a newborn baby and unable to find work. Joni kept this a secret for many years but she finally told "Vogue" magazine in 1994: "I had had a child, and I was broke, literally penniless. And I met Chuck Mitchell, and he said he would take us on. I was kind of railroaded...we were never suitable. I went down the aisle saying 'I can get out of this.'" A few weeks after the birth, Joni married folk-singer Chuck Mitchell. He promised to help take responsibility for the child but something changed, and a few weeks later Joni gave up her daughter for adoption. In the summer of 1965, Chuck Mitchell took Joni with him to the U.S. to live and work in Detroit. In the summer of 1966 a relative unknown walked onto the stage at the Newport, Rhode Island Folk Festival, after being introduced by Judy Collins. It was a breezy summer's evening and the crowd was restless. I remember thinking that this newcomer, whoever she was, was stepping into some serious company. I can't recall the exact lineup. Probably Tim Hardin, Fred Neil, Odetta, Phil Ochs, Tom Paxton, and the like. As I said, `serious company...' She appeared to be carrying a tiny Martin Triple-0, but I couldn't be sure. She wore a long dress. I was too far back to decipher the face. There was a round of light applause when she was introduced. A tentative strum rolled from the huge PA, then another, and she was beginning her opening number. The song was 'Michael from Mountains'. And by the end of the first verse, the crowd had gone from bordering-rude to pin-drop silence. I was riveted. When the song ended, the strangest thing occurred. For at least five seconds (look at your watch...try to imagine it) the place was dead-silent - ten or fifteen thousand people - dead silent - and then a huge release of cheers and applause. The short set included `Chelsea Morning', and I think she played `The Circle Game' before leaving the stage to a tumultuous and prolonged standing ovation. I remember feeling so grateful for this amazing new talent and feeling equally sorry for anyone unfortunate enough to be going onstage after her. 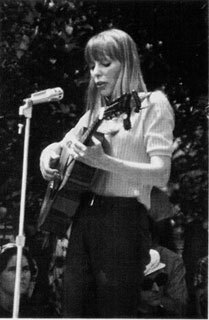 The marriage and partnership of Joan & Chuck Mitchell dissolved in a year and a half, and in early 1967 Joni Mitchell moved to New York City to pursue her musical dreams as a solo artist. She played venues up and down the East Coast, including Philadelphia, Boston, and Fort Bragg, North Carolina, and she built up a strong following as a live performer and a burgeoning reputation as a songwriter. I can never become that kind..."
Folk singer Tom Rush had met Joni in Toronto and was impressed with her songwriting ability. He took "The Urge For Going" to Judy Collins but she was not sufficiently interested in the song at the time, so Tom recorded it himself. Then country singer George Hamilton IV heard Tom performing it and recorded a hit country version. Other artists who recorded Mitchell songs in the early years were Buffy Saint-Marie, Dave Von Ronk and eventually Judy Collins. Due to the recording of her songs by others, she began to get more bookings in cities like Chicago and various towns in Florida. But New York was a harder nut to crack. And they've got the wings to go..."
And I'm so all alone..."
Performing for children at the Catholic Hospital in detroit, early 1967. This article has been viewed 27,687 times since being added on March 28, 2009.